There's nothing I can tell you about Glenfiddich that you already don't know. It is unquestionably the most popular single malt whisky in the world. They are by and large one of the most consistently above average whiskies produced given their staggering levels of output. In fact I recently read they're scaling up production to meet demand and more Glenfiddich in the world is, in my opinion, a good thing! I was invited by our local distributor for an evening of tasting the classic Glenfiddich range which was quite nice. It's quite common to give these expressions a pass just because they're the most drunk whisky in the world. And you kind of forget why they're No1. It's because they are pretty damn good. This is half decent though I feel that the palate was a touch over-oaked and a bit thin. The general consensus among the group was that it felt like it was made to order. And by that I probably mean that all the flavors that are supposed to please me were there but for some reason didn't work so well together. It's not a bad whisky. It's not awesome either. The final two statements in your review sum up 'Fiddich, if you ask me. Many 'snobs' will turn their noses up at this over-marketed malt, but it is perfectly fine whisky. It's just like the eternal C+ student in the class... don't expect it to give you anything more than the norm. The 21 Year Old Gran Reserva from Glenfiddich can be considered to be the top of the core range from this distillery. I tried it several times (even before it was renamed Gran Reserva), but will now try the new edition that is bottled at 43,2% ABV. The whisky got a finish on Cuban rum casks. The nose is creamy and sweet on apples, pears and loads of honey. Hint of Fanta. Caramel and some demerara sugar (must be from the rum cask). I also get a nice trace of woodsmoke. The arrival is a little less creamy, but punchy. The oak speaks first. Loads of spices like cinnamon and ginger, but also licquorice and a hint of pepper. Then the sweetness kicks in: sugared oranges, apple sauce and some pear syrup. The oranges turn slightly bitter Midpalate. The finish is fairly long with a lot of bitter oranges, green herbs and oak. Very fruity Glenfiddich, but a touch too bitter, which began softly on the nose, became bigger on the palate, but exploded in the finish, totally overpowering the sweetness. Now here's another distillery that is owed a lot by single malt snobs all over the world. Thanks to Glenfiddich, and their enormous marketing budgets, the world has some idea of what single malts are. This interest keeps the industry alive and allows nerds like me to savor the fruits (or should I say nectar?) of this labour of love. Now I'm not saying Glenfiddich are only popular on the back of the marketing dollar (unlike other distilleries). No. In fact they are one of the only mass produced whiskies with a truly remarkable level of quality and craftsmanship. Their core range and recent experiments are all extremely competent. Which brings me to this 21 Year Old Caribbean Rum Cask finish. Had at a tasting recently this is a wonderfully crafted expression. After spending close to 20 years in bourbon barrels it has been finished in rum casks from Sancti Spiritus in Cuba for period of 5 to 9 months. The result is pure toffee. Nose: Toffee. Lots of it. A lot of bananas, apricots and blood oranges. All smeared with toffee. Chocolate fudge cake with dates sealed in a box of Quality Street. Hint of salt with a touch of ginger. Palate: Smooth and creamy delivery of dates and cherry liqueur. The ginger is back and it's grated on top of the toffee bananas. Finally black pepper on Quality Street with a hint of mint. This is a super robust delivery. Finish: The woody chocolate peppers are long and true. A fantastic dram that holds aloft the brightly burning torch that is Glenfiddich. Introducing Glenfiddich would be somewhat silly, no? It is only one of the best known whiskies in the world. So let us get straight down to tasting this 21 Year Old. After maturing for over two decades on bourbon casks, it was finished for a period of 5 to 9 months on rum casks from Sancti Spiritus near the Sierra del Escambray in Cuba. You will pay a little over 100 EUR for a bottle. I tried the older version already, which was then replaced by the Gran Reserva, but by now is again simply labelled 21 Year Old. I scored this sample at the Whisky Festival in Ghent. It sports a very sweet nose (hey, what did you expect?) with juicy fruit. Banana, pineapple, oranges, litchee, plums and apricots. Wow, this is very fruity. Hints of flowers, vanilla and cedar wood. Very creamy and spicy (ginger, pepper, but also some cinnamon) with a lot of drying oak on the palate. Not too dry, though. Gingerbread. Oranges and pear. Banana again. Touch of leather. Some mint gives it a fresh touch. On the finish, the oak does get a bit loud. Despite the somewhat drying finish, this is better than the 2010 release that I tried before. The rum did its job, without being too prominent. I was given a bottle last Christmas by my stepson and really enjoyed its deep fruity flavor through the winter. I'm still saving the last half for this winter, as he told me to "not knock it back". Really appreciate his thoughtfulness, as I know it wasn't cheap. Probably the best present I've had in a while, as I'm usually Santa, and not the receiver. 21 Years in a variety of casks (of-course most notably the last 4 months in ex-Caribbean Rum) has made the Gran Reserva by Glenfiddich an interesting and complicated whisky. The nose is elegant, blowing wafts of roast almonds, brown sugar toffee and mixed spice, with a firm backbone of sweet rum, while to taste there is a bitter flavour similar to pine-needles (the things I ate as a kid hey…) balanced by sweet over-ripe fruit and more mixed spice (cinnamon is definitely present). Not the longest finish around, but decent nonetheless. Definitely worth a look if you are hunting for something different. First vapor: Leather and cherry with clove. Nose: Yes sugarcane, in a stewed mixture of pitted fruits (mostly plum) and vanilla. Plus orange rind and a light freshness like laundry with white fruit pulp. Palate: Orange nutmeg and sweet vanilla, becoming a faint ginger powder on underripe pear pulp. Feels like a freshly sliced almond sitting on the tongue. Clean. Finish: Short, of nutmeg and ginger, perhaps over white peach. A creamy sensation lingers. This exhibits the lightness I've found in most of the Glenfiddich samples: Despite any dark packaging, most of the experience feels "white". What I find special about this, compared to e.g. the 14 and 19, is the silky smoothness. The 14 had bitterness in nose and finish, and sourness in the palate. The 19 also had these but less so. The 21 seems to have tempered these, perhaps sacrificing some flavor or character in the palate-- The result is just balanced levity. Out of the "light shades" of Scotch I have tried so far, this is the one I would most like to pull out on a warm summer evening. The Glenfiddich 21 Year Old got an extra finish in rum casks from the Caribbean. So I expect a whole lot of sweetness. This is the older bottling, by the way. 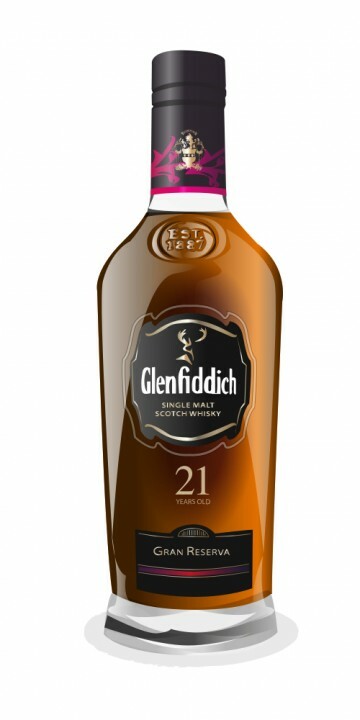 Glenfiddich recently relaunched this 21 Year Old as Gran Reserva. Yep, the expectations of the nose are fulfilled. While rather closed, a bit of patience reveals a whole panoply of sweet aromas. Vanilla and sugar cane, immediately followed by dried fruits. Hints of plums and apricots. Something grassy. Strawberry jam. Dark chocolate. Some banana and even mango guarantee an exotic twist. Soft, but very inviting. Unfortunately, the first sip is very watery. But after the initial and very sweet start on pears and oranges, it reveals a spiciness on ginger and pepper, that makes up for a lot. The rum influence becomes obvious. Demarara. Midpalate, I get more citrus, which lifts the malt and prevents the sweetness from going out of control. The medium long finish on nuts and dried fruits dies on woodspice. This whisky goes crescendo. It started off soft, but midpalate it opened up to reveal a big, grown-up Glenfiddich, that is not overpowered by the rum. Havana Rum Barrel Finish, 21 year, thanks to ygtbsm94. Phenolic, estery nose with hot alcohol coming through. Taste is powerfully fruity, loads of black cherries and baked raspberry. Finish is very relaxed, smooth, no burning or alcohol heat. Hints of tropical complexities. Very delicious. Quite the treat. Thanks Brad! Super-smooth and great depth and complexity. Overall: I thought the rum would dominate but it dosen't. Its delicate and refined for a Glenfiddich. A great present to receive but for the hefty price tag there are better drams out there. Nose: Rich , thick, a lot of the rum influence, with chocolate, rum,brown sugar. Palate: Thick, and rich with chocolate, spice, quite buttery and mouth coating. Finish :Long, coffee, cocoa, and milk chocolate. A rich and very well made Rum finish. Not lacking complexity and very rewarding. it was a very nice opportunity to sample a few Gfs, i had the 21 for the first time, and really liked it. If i had to pick one, I’d go with the 15 year old, which offers great value at ,£32 and a very sweet and delicious profile. Glenfiddich may not be the sexiest brand around, but they do offer an interesting and a well made core line of whiskies. I had a few glasses of this Glenfiddich over the Christmas break and what a treat. A lovely golden Whisky with an array of aromas from rich-chocolate orange to maple-Bourbon, long legs in the glass with just a touch of water, smooth and buttery on the palate with a mature citrus tang and light smoky and warming finish. Am looking forward to getting a bottle of this and making it last. This was the third bottle opened today and I must say it was nice to change from a Blend (Chivas 12) to an Islay (Ardbeg 10) and finally onto a Speyside (The above bottle). 3 Distinct and different bottles, and all with something to say. Well rounded and sweet chocolaty body with a hint of the Caribbean and some lovely fruity undertones. Finishes off with an orange peel inkling and maintains the chocolaty flow. Warm and lingering. Overall impression: Warm, soft, and well balanced dram highly complimented by the rum casks. an excellent choice in the Glenfiddich line although slightly on the high price tag side. Yeah, this is a genuinely good whisky. Not sure it is worth it's price tag, but very nice with a lot going on. The nose is quite rich - chocolate, toffee and hints of the smell I associate with a new leather couch. The taste continues the chocolate and toffee, and adds a taste that reminds me of the smell of secondhand smoke from quality pipe tobacco. Very smooth and a little dry. I'm no expert, but this tastes very mature to me. The finish is gentle, but nicely warm and quite long. Some more chocolate and hints of fruit. Overall, this dram is gentle, easy and smooth, but very fulfilling. I'm not sure it's quite worth the price tag, but it's certainly not too far off. By far the best Glenfiddich I've tasted, and amongst the top double handful of everything I'v tried.